An international team of astronomers has used the NASA/ESA Hubble Space Telescope to look for atmospheres around four Earth-sized planets orbiting within or near TRAPPIST-1’s habitable zone. The new results further support the terrestrial and potentially habitable nature of three of the studied planets. The results are published in Nature Astronomy. 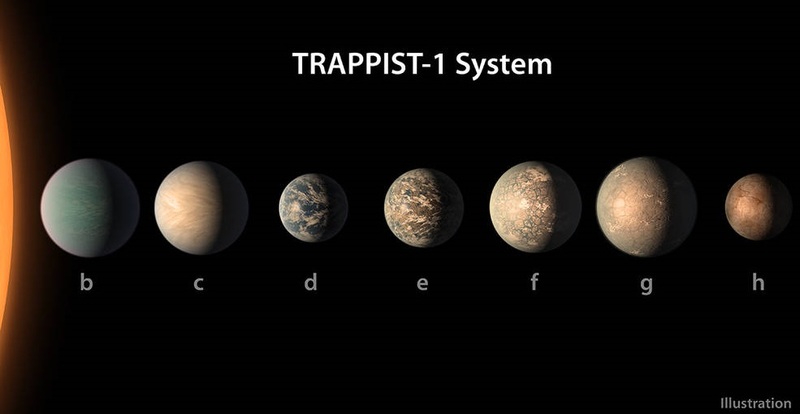 Seven Earth-sized planets orbit the ultracool dwarf star TRAPPIST-1, 40 light-years away from the Earth. This makes TRAPPIST-1 the planetary system with the largest number of Earth-sized planets discovered so far. These planets are also relatively temperate, making them a tantalizing place to search for signs of life beyond our Solar System. Now, an international team of astronomers has presented a study in which they used the NASA/ESA Hubble Space Telescope to screen four planets in the system — TRAPPIST-1d, e, f and g — to study their atmospheres. Three of the planets orbit within the system’s habitable zone, the region at a distance from the star where liquid water — the key to life as we know it — could exist on the surface of a planet. The fourth planet orbits in a borderline region at the inner edge of the habitable zone. The data obtained rule out a cloud-free hydrogen-rich atmosphere for three of the planets — but for the fourth planet, TRAPPIST-1g, such an atmosphere could not be excluded. While the results rule out one type of atmosphere, many alternative atmospheric scenarios are still consistent with the data gathered by de Wit and his team. The exoplanets may possess a range of atmospheres, just like the terrestrial planets in our Solar System.